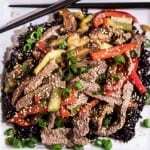 Tender beef stir-fried with crunchy baby bok choy, sweet red pepper, and meaty shiitake atop exotic forbidden/black rice… Beef and Baby Bok Choy Stir Fry With Black Rice is healthy and delicious, and quick enough for your weeknight supper! What’s that you say? Rice isn’t supposed to be black? Black rice is a bit of an oddity. 😯 Black rice, also referred to as forbidden rice or emperor’s rice, is revered in China as an extremely healthy food. It is also expensive; the yield from a crop of black rice might be as low as 10% of the yield of more common varieties. Hence the name… black rice was reserved for the tables of emperors in ancient Chinese culture. It was forbidden to the masses. Black rice gets its color from an excess of anthocyanin like dark purple eggplant, blueberries, concord grapes, blood oranges, purple cauliflower, etc. Anthocyanin is a powerful antioxidant that provides many health benefits. The hull of black rice has one of the highest levels of anthocyanin antioxidants of any food! It is no longer “forbidden,” though you may have to look a little harder to find it. You can find it at most health food stores, gourmet food markets, and Asian markets. Because black rice is unrefined, it takes longer to cook. For this reason, I cook black rice in my pressure cooker. I follow the Pressure Cooking Today instructions for Forbidden Black Rice, but I have changed the quantities to serve 4 rather than 6. (I am a monthly contributor to the website, and it is an excellent resource!) If you don’t have a pressure cooker, cook according to your package instructions. Keep in mind the cooked rice will be chewy and firm to the bite rather than fluffy like white rice… For more on black rice, see The Forbidden Rice: Black Rice Nutrition & Benefits. Polished white rice – contains 6.8 g protein, 1.2 mg iron, 0.6 g fiber. Brown rice: 7.9 g protein, 2.2 mg iron, and 2.8 g fiber. Red rice: 7.0 g protein, 5.5 mg iron, and 2.0 g fiber. Black rice: 8.5 g protein, 3.5 mg iron, 4.9 g fiber, and the highest amount of antioxidants of any rice variety. 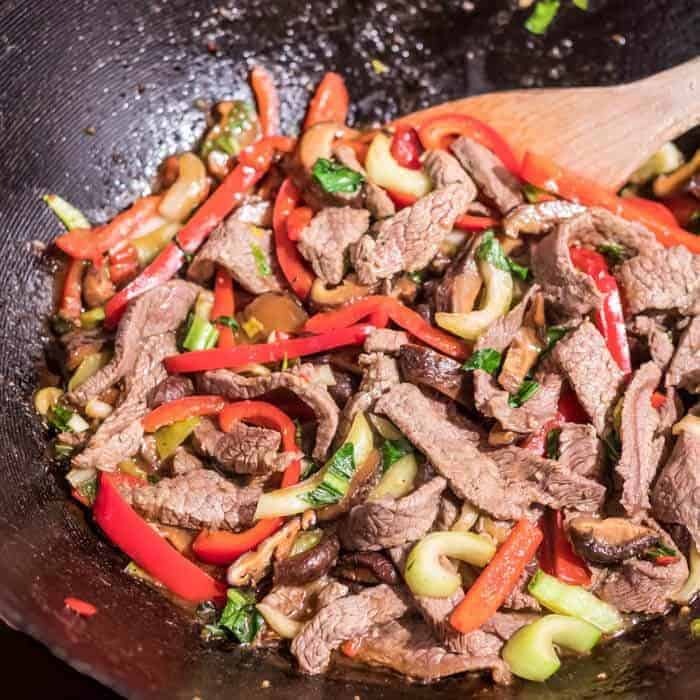 I have been making some version of this Beef and Baby Bok Choy Stir Fry for over 30 years. It is one of my favorite combinations. 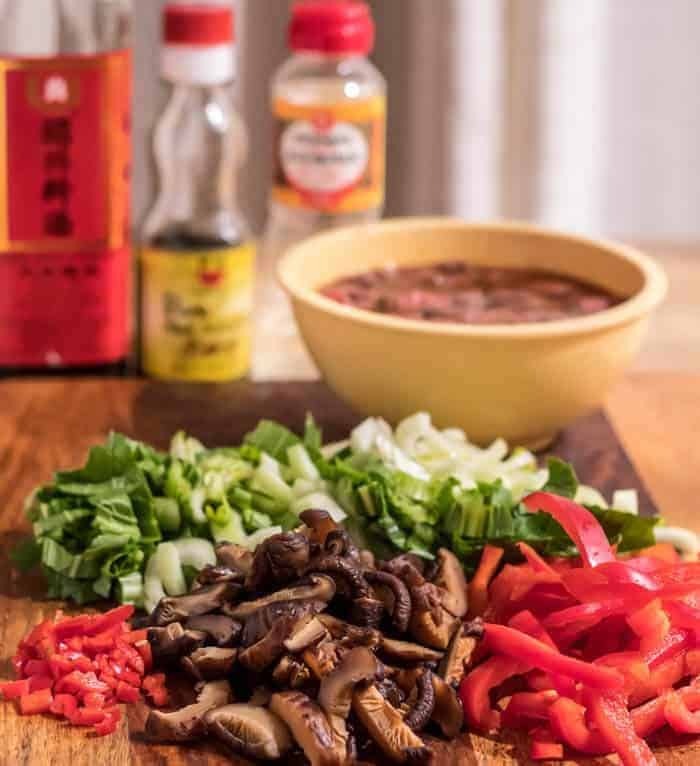 I keep the sauces and condiments, and the dried shiitake in my well-stocked pantry, and with a few fresh ingredients, it makes a regular appearance at the Andersen table. Start the black rice (if using). In a medium-sized bowl, whisk together marinade ingredients, and add the thin sliced beef. Cover the dried shiitake with boiling water. Start the white rice (if using). Prep the veggies including the scallions for garnish. Are stir fried dishes a part of your weeknight repertoire? If not, I highly recommend investing in some Asian cookware and stocking your pantry with Asian sauces and condiments. This really is a “go to” meal for busy weeknights at our house! 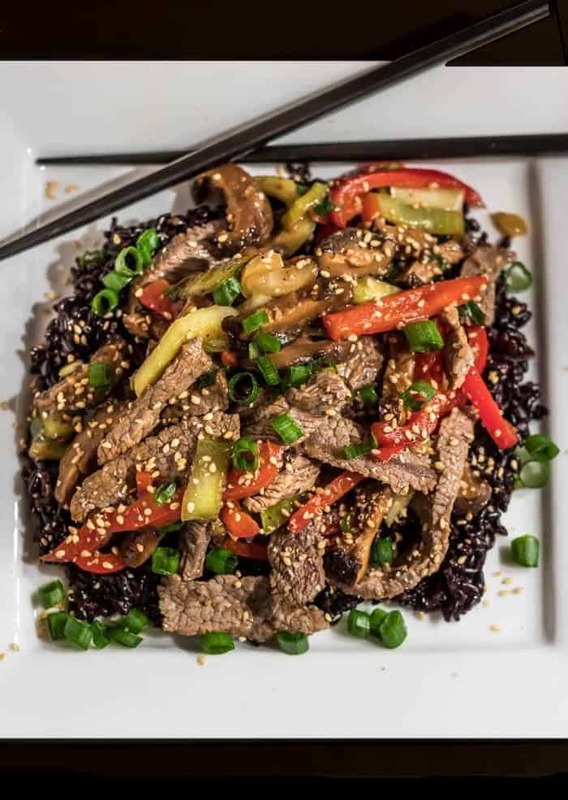 A simple beef and vegetable stir fry sits atop forbidden black rice in a healthy, flavorful, and quick one dish meal perfect for a busy weeknight! Combine the rice, water, oil and salt in the pressure cooker pot. Lock the lid in place and select High Pressure and 22 minutes cook time. While rice cooks, start the stir fry. The stir fry only needs about 20 minutes to prepare, so hold off a bit if you need to. The rice needs a total of about 32 minutes. When beep sounds turn off pressure cooker and use a natural pressure release for 10 minutes. After 10 minutes release any remaining pressure with a quick pressure release. When valve drops, carefully remove lid tilting it away from you. Fluff rice with a fork. Whisk the ingredients for the beef marinade together in a medium-sized bowl. Add the thin sliced beef, and stir to combine. Set aside. Cover the dried shiitake with boiling water in a small prep bowl or ramekin. Set another ramekin on top to keep them submerged. After 20 minutes, strain liquid through a fine mesh sieve and set aside, pressing additional liquid out of mushrooms with your fingers. Pat the mushrooms dry with paper towels. Heat oils in wok or large saute pan until very hot. Add the ginger and garlic. Stir fry until almost all the pink is gone. Remove from the wok, and set aside. Add additional oil if needed. Add the red pepper, fresno chile, and baby bok choy. Stir fry 2 to 3 minutes. Return the beef to the pan. Add 1/2 cup mushroom liquid (add beef or chicken broth to 1/2 cup) and the cornstarch to the reserved marinade. Whisk to combine. Add to the wok, and stir to incorporate into the stir fry. When the mixture is bubbly, the stir fry is ready. The rice should be finished at about the same time as the stir fry. Plate a scoop of rice, top with beef and baby bok choy stir fry, chopped scallions and toasted sesame seeds. I'm all about portion control. We typically do 4 to 6 ounces of lean protein. I have specified 12 ounces for this recipe, and it serves 2 generous or 3 smaller portions. You can substitute pork, turkey, chicken, even tofu for the beef. This combination of veggies works well time-wise. Both the peppers and the bok choy require only 2-3 minutes in the wok. If you use harder vegetables, that step will require additional cook time. I love to use Fresno chile to get the heat in a stir fry, but I can't always find them. You can add a teaspoon +/- sriracha or chile paste to the marinade instead. My trainer has just added Black Rice to my diet, so i was just checking out its health benefits and all. I came across this post and i must say that you have explained things really well. Moreover, with that i just got a wonderful recipe as well. I would rate this full on full. Cheers! Yay! 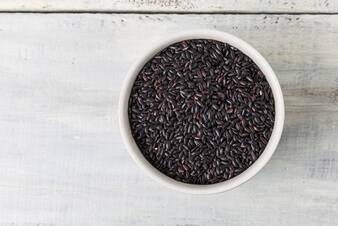 Black rice is very slowly catching on, and as you've discovered, is so healthy! I hope to develop more recipes in the near future... Cheers to you, and thanks for taking time to write!